As school bus industry telematics advance and become more nuanced, school districts are trying to balance the ability to make their routes more efficient while also creating consistency for students and parents. Without dynamic routing, routes remain stagnant and largely inefficient; bus stops can often go unused for days at a time. At the same time, riders want to know they still have the option to use the school bus when they need it. Transportation staff and school administrators are talking about the best ways to use the technology they have through GPS devices, routing software, and their student information database to create the best options for everyone involved. They’re looking at dynamic routing patterns that tell them which students should be picked up and dropped off, how to line them up in the most efficient manner, and how to allow students and parents to notify the school when they do or don’t need a ride. With this new technology, school districts could potentially create an “opt out” policy that removes a bus stop from the system if a student doesn’t use the bus for a specified number of days. Once a stop disappears, transportation staff can optimize the route. Students can opt back in at any time to rejoin the route. For some school districts, it may be useful to encourage parents to opt out of their transportation route — and then reward them for it. If a student doesn’t tend to use the school bus much, or never plans to, transportation officials can thank them for supporting efficiency and reducing waste. A small gift, such as a $20 gift card, may be useful in pushing undecided candidates forward. Although routing software has enabled transportation staff to change routes quickly, it’s unreasonable to expect daily changes based on opt-in or opt-out communication from riders. Instead, schools could promote a “beginning of the semester” or “first of the month” opt-out period for students to make choices and pick a set schedule. Then officials can finalize new routes and bus stop times that can be sent out to parents via push notifications, texts or emails. At Westland High School in Ohio, for example, juniors and seniors can fill out a form to “opt-in” for a daily seat. Otherwise, they’re opted-out of a reserved seat but can rejoin at any time by visiting the school office and requesting a form. Lakeland School District in Pennsylvania offers a similar option for all grade levels — and signing the form doesn’t prevent children from riding school buses for field trips, athletic events and emergency evacuations, for instance. School administrators can prepare their schools for potential opt-in and opt-out transportation participation initiatives by signing up for the fleet telematics system now that will allow them to roll out new options in the future. The SafeStop app, for instance, already offers information that helps transportation directors, administrators and parents know where buses are and estimate drop-off/pick-up times. 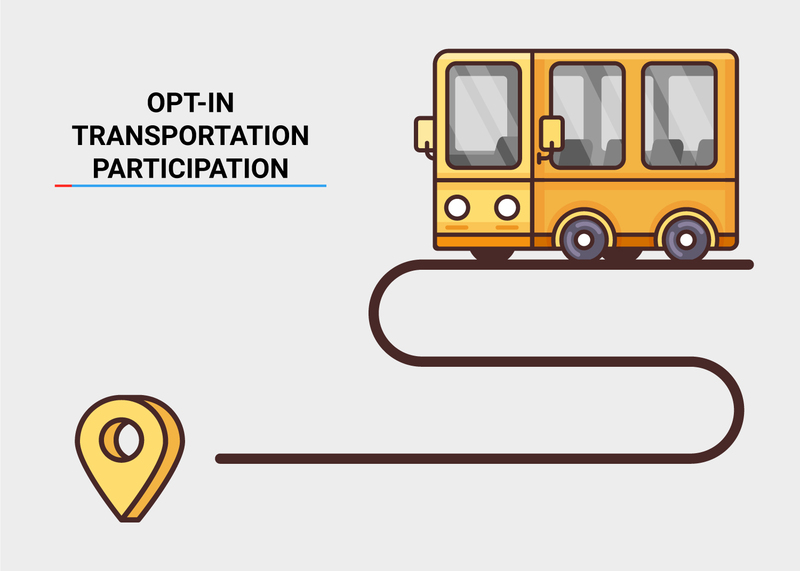 As more complex options become available, districts will be prepared to showcase their new opt-out transportation offer — and save budget dollars by becoming more efficient.